No matter what the decade, no matter the technology, no matter the state of public consciousness, the salient rules of entertainment will always apply: if you're going to make someone laugh at the absurd, tell some truth with it; if you're going to make someone cry, give them a silver lining to look to; and if you're going to insult someone, as the legendary Don Rickles has for the last 55 years, always end it with a wink and a smile. That's the essence of tension and release. It lies at the core of artistic expression, and its importance can't be ignored for long. Snarky gossip bloggers, take heed: you will never have a better knack for cutting people down than Don Rickles does, and you owe much of your success -- both pecuniary and otherwise -- to the groundwork laid by him. There's no doubt that at their most irreverent (and yes, mean), gossip blogs can be truly funny. After all, as Rickles has shown the world for years, there's infinitely more material to be mined in the delicious details of the detested than there are in the lauded. Five words for good, five thousand for bad. But there's one element that has always gone missing in the new era of dissery, and perhaps it's the most important part of the game. It's what's given Rickles the room to move with almost diplomatic immunity through cultural stereotypes and sensitivities: that effusive smile, the "not really", and most importantly, the implicit "me too." It's what has given Rickles both his edge and his charm for over five decades, and its absence in today's gossip media is what will soon lead to a population tired of it. 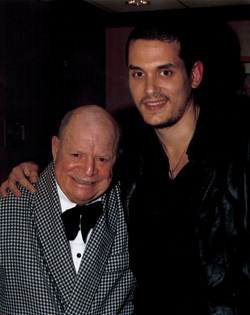 At Rickles' recent performance at Foxwoods Casino in Connecticut, he made Perez Hilton look like a sycophant. Nobody -- and I mean nobody -- has what it takes to point out a morbidly obese man in the front row and call him out on it in song. (The man laughed hysterically.) After ribbing two men on stage, making fun of both them and their wives, he had handlers walk bottles of champagne to their seats, thanking them for playing along and suggesting they enjoy the bottles in their hotel rooms while making love. It doesn't make the bite any less sharp, but it invites people to return to the lion's cage. I can still hear them. Or is that too much kindness for one person to be allowed? Wouldn't it be nice, every once in a while, to read some sort of evidence of heart? An occasional 'We kid, the guy's okay??' Unless you really don't, in which case you won't be sorry when that bear shoots me with a rocket launcher. Mark my words: the gossip-monger whose style closest resembles that of Don Rickles' mastery of tension and release will stay successful the longest. Because the salient rules of entertainment will always apply. And Don Rickles should know, because he helped write them.